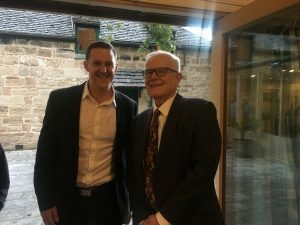 At Glover Cottages on Tuesday 28 February, Professor James Laurenceson, the Deputy Director of the Australia-China Relations Institute at the University of Technology Sydney, detailed how Australia’s relationship with China had been severely harmed by the recent antagonistic rhetoric in Australia. Professor Laurenceson began his talk with an overview of the economic positives in Australia’s relationship with China. The statistics demonstrated that Australia’s economic relationship with China has never been better. Contrary to popular belief, mining exports were not collapsing: despite falling iron ore prices, China is now demanding more iron ore than ever, along with more mineral and energy products generally. Along with a booming tourism and education industry, our agriculture and service exports have also increased dramatically. While China’s increasing investment in Australia has alarmed critics, the stock of Australia’s investment in China is similar. This highlights both the parity in our economic relationship and the need to keep China’s economic advances in perspective. Although China’s growth rate is slowing, this must be seen in the perspective of an economy growing off a larger base every year. But for how long can we maintain this economic relationship that has reached such unprecedented heights? At what point do the politics spill over and drag down this relationship? At the end of 2017, Foreign Minister Bishop uncharacteristically criticised China’s lack of democracy in a speech in Singapore, the first in an escalating series of confrontational public statements. This was followed by Prime Minister Turnbull singling out China as a foreign interference concern, mocking a famous quote from Chairman Mao in Chinese and suggesting Chinese students could be spies. Such remarks were met with anger and disdain by the Chinese government, which normally refrains from commenting on Australian legislation. As the rhetoric between both countries escalates, it may compromise the continued effectiveness of ChAFTA (China Australia Free Trade Agreement), and the Chinese government may obstruct the travel of Chinese tourists to Australia in retaliation. In a world where many mock President Trump for his incompetence at diplomacy, Professor Laurenceson concluded by contrasting Prime Minister Turnbull’s confrontational rhetoric with the positive tone espoused by President Trump towards China in spite of their differences on trade and geopolitics. The relationship between China and Australia will always be a struggle. Perhaps, as questions suggested, too much emphasis was being placed on the impact of negative rhetoric on this relationship. While recognising this, Professor Laurenceson stressed the need to strengthen our relationship with China in a world increasingly shaped by China, for the benefit of an Australia that has grown too suspicious of Chinese interests.